TEHRAN, Iran (AP) — A grainy video of female officers from Iran’s morality police assaulting a young woman whose headscarf only loosely covered her hair has sparked a new public debate on the decades-long requirement for women in the Islamic Republic. While officials of all ranks up to President Hassan Rouhani have weighed in on the incident, it has seen women in Iran not only question the rule that they must wear the hijab in the street but also their faith in the theocratic Shiite-dominated nation. Even before the 1979 Islamic Revolution, the long, flowing black robes for women known as chadors and the headscarves, or hijabs, were both a political and religious symbol in the Shiite-dominated nation. It shows a young woman with a long red scarf loosely covering her head, her hair clearly showing, being surrounded by three morality policewomen wearing chadors, who grab her. One grabs her by the throat. She screams, they pick her up off her feet. She then ends up on the ground, weeping as another woman comforts her before the officers grab her again. “Why are you hitting me? You have been destroying us for 30 years,” she is heard shouting at one point. The video went viral on social media and drew an immediate reaction from officials. Iran’s interior minister, Abdolreza Rahmani Fazli, ordered authorities on Thursday to investigate the incident soon after Masoumeh Ebtekar, a female vice president for women’s affairs, condemned the police’s “violent” approach to the situation. Reformist lawmaker Tayebeh Siavoshi said Saturday that the policewoman seen in the video grabbing the young woman’s throat has been suspended pending the investigation. None of the women in the video have been identified. “Imposing (force on women) will lead nowhere,” she said. Hard-liners, however, have dismissed the video as a foreign plot. The hard-line Kayhan daily on Sunday described the video as “strange and suspicious,” noting foreign activists have promoted it. Previously, hard-liners pointed to a campaign challenging the hijab launched by a journalist at the Persian service of the Voice of America, which is funded by the U.S. government. But on the streets of Tehran, women are openly discussing the video and their own encounters with morality police. Sahar, a 25-year-old university student, agreed. The hijab and chador have long been parts of Persian culture. They became political symbols in 1936, when Iran’s pro-Western ruler Reza Shah Pahlavi banned the garments amid his efforts to rapidly modernize Iran. The ban became a source of humiliation for some pious Muslim women in the country. The hijab and loose-fitting clothing later became mandatory for all women in Iran. And though some freedoms for women were curtailed in the years that followed, Iranian women were still allowed to drive, unlike in Saudi Arabia, and hold public office. 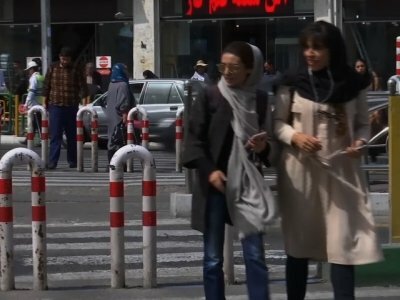 In Tehran today, some fashionable young women wear tighter clothes with a scarf loosely covering their head, technically meeting the requirements of the law while drawing the ire of conservatives. Women arrested for showing their hair in public in Iran can receive jail terms of two months or less and face fines equivalent to $25. In December, Tehran’s police said they would no longer arrest women for not observing the Islamic dress code as video clips of women choosing not to wear hijabs and walking the streets with their heads uncovered spread across social media. One image — of a young woman, head uncovered and waving her hijab like a flag in Tehran’s Enghelab Street — became famous during economic protests that swept Iran later that month. Tehran’s prosecutor, Abbas Jafari Dolatabadi, said in March that the woman had been sentenced to 24 months in prison. The telecommunication junction box she stood on in the photograph has since been re-welded to stop women from standing on it, though protests continue. Associated Press writers Jon Gambrell in Dubai, United Arab Emirates, and Amir Vahdat in Tehran, Iran, contributed to this report.